Microprocessor cores used for SOC design are the direct descendents of Intel’s original 4004 microprocessor. Just as packaged microprocessor ICs vary widely in their attributes, so do microprocessors packaged as IP cores. However, SOC designers still compare and select processor cores the way they previously compared and selected packaged microprocessor ICs. The big problem with this selection method is that it assumes that the laws of the microprocessor universe have remained unchanged for decades. This assumption is no longer valid. Processor cores for SOC designs can be far more plastic than microprocessor ICs for board-level system designs. Shaping these cores for specific applications produces much better processor efficiency and much lower system clock rates. Together, Tensilica’s Xtensa and Diamond processor cores constitute a family of software-compatible microprocessors covering an extremely wide performance range from simple control processors, to DSPs, to 3-way superscalar processors. Yet all of these processors use the same software-development tools so that programmers familiar with one processor in the family can easily switch to another. 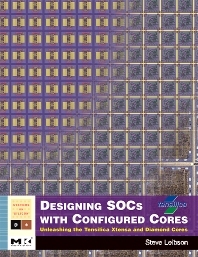 This book emphasizes a processor-centric MPSOC (multiple-processor SOC) design style shaped by the realities of the 21st-century and nanometer silicon. It advocates the assignment of tasks to firmware-controlled processors whenever possible to maximize SOC flexibility, cut power dissipation, reduce the size and number of hand-built logic blocks, shrink the associated verification effort, and minimize the overall design risk. · An essential, no-nonsense guide to the design of 21st-century mega-gate SOCs using nanometer silicon. · Discusses today's key issues affecting SOC design, based on author's decades of personal experience in developing large digital systems as a design engineer while working at Hewlett-Packard's Desktop Computer Division and at EDA workstation pioneer Cadnetix, and covering such topics as an award-winning technology journalist and editor-in-chief for EDN magazine and the Microprocessor Report. · Explores conventionally accepted boundaries and perceived limits of processor-based system design and then explodes these artificial constraints through a fresh outlook on and discussion of the special abilities of processor cores designed specifically for SOC design. · Thorough exploration of the evolution of processors and processor cores used for ASIC and SOC design with a look at where the industry has come from, and where it's going. · Easy-to-understand explanations of the capabilities of configurable and extensible processor cores through a detailed examination of Tensilica's configurable, extensible Xtensa processor core and six pre-configured Diamond cores. · The most comprehensive assessment available of the practical aspects of configuring and using multiple processor cores to achieve very difficult and ambitious SOC price, performance, and power design goals. PRIMARY: Industry practitioners; System-on-Chip engineers designing embedded systems. SECONDARY: Text for undergraduate and graduate level courses on Embedded Systems.